Chicken Little of the Sea Visits Station ALOHA | Watts Up With That? My never-ending search for actual observational data that support the hypothesis of catastrophic anthropogenic ocean acidification (Chicken Little of the Sea) has taken me to offshore Hawaii and Station ALOHA. The alarmists claim that anthropogenic CO2 emissions have lowered the average pH of the world’s oceans from 8.2 to 8.1 over the last 250 years; and that future emissions will lower the pH by 0.3 to 0.4 over the remainder of this century (Dore et al., 2009). What is the basis of this hypothesis? Systematic measurements of oceanic pH don’t go back much before 1990. Actual pH measurements are few and far between. The oceans have probably absorbed at least half of the anthropogenic carbon emissions of the last couple of centuries. 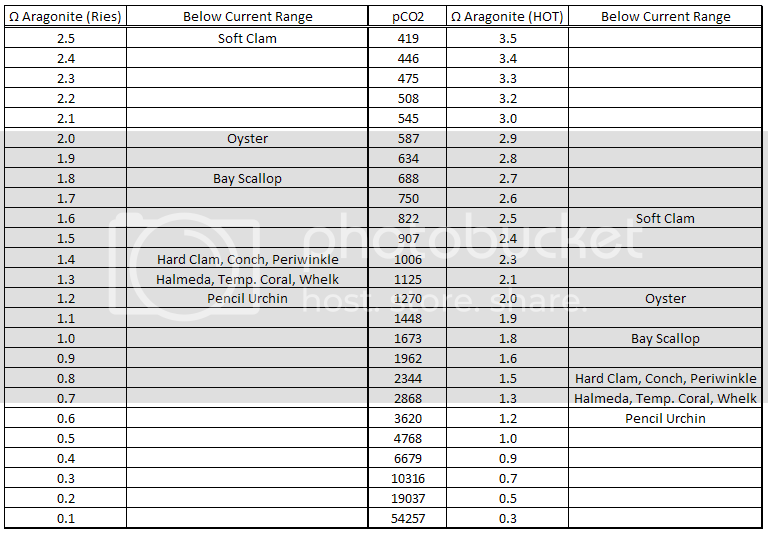 The assertion of CO2-driven ocean acidification appears to he almost entirely based on the rising atmospheric CO2 level. Is this the only basis for the dire warnings of catastrophic ocean acidification? All other things being equal, the addition of CO2 should lower the pH of seawater… However, all other things are seldom equal. At first glance, this appears to be a slam-dunk. 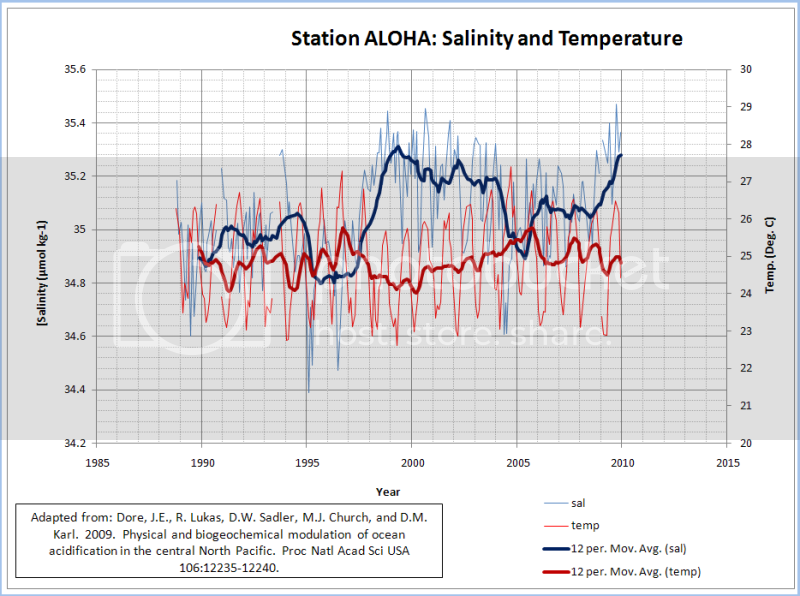 The seawater at Station ALOHA have been acidifying in concert with rising atmospheric CO2 for ~20 years. But, looks can be deceiving. One of the tricky things about oceanic pH is that it is very dependent on water temperature, pressure and salinity. Most studies derive pH from Dissolved Inorganic Carbon (DIC or ΣCO2) and Total Alkalinity (TA). DIC is the sum of free CO2 ([CO2(aq)] & [H2CO3]), carbonate ([CO3–]) and bicarbonate ([HCO3-]). TA is the sum of carbonate (2x[CO3–]), bicarbonate ([HCO3-]), tetrahydroxyborate ([B(OH)4-]), hydroxide ([OH-]), hydrogen ([H-]) and other minor compounds. DIC and TA are “conservative quantities” – They are unaffected by pressure and temperature. 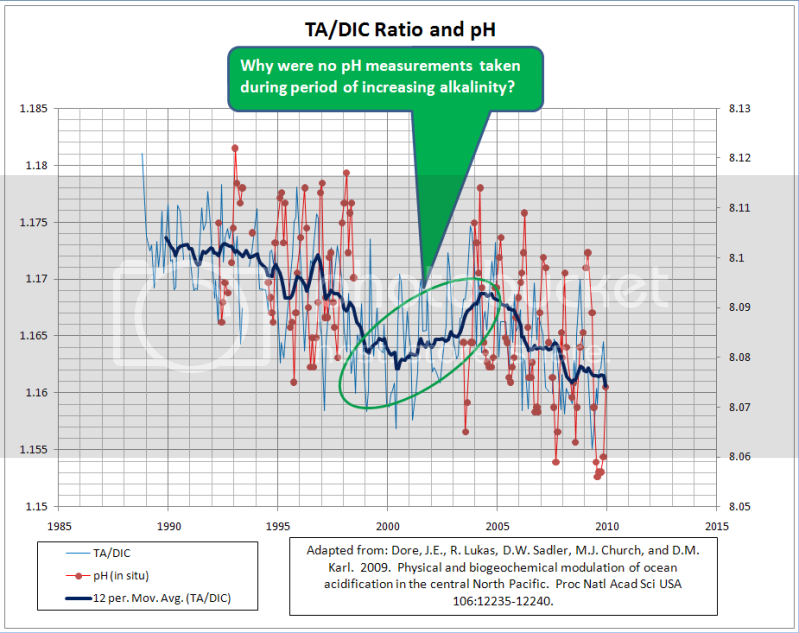 The ratio of TA:DIC is a very robust measure os the alkalinity/acidity of seawater. 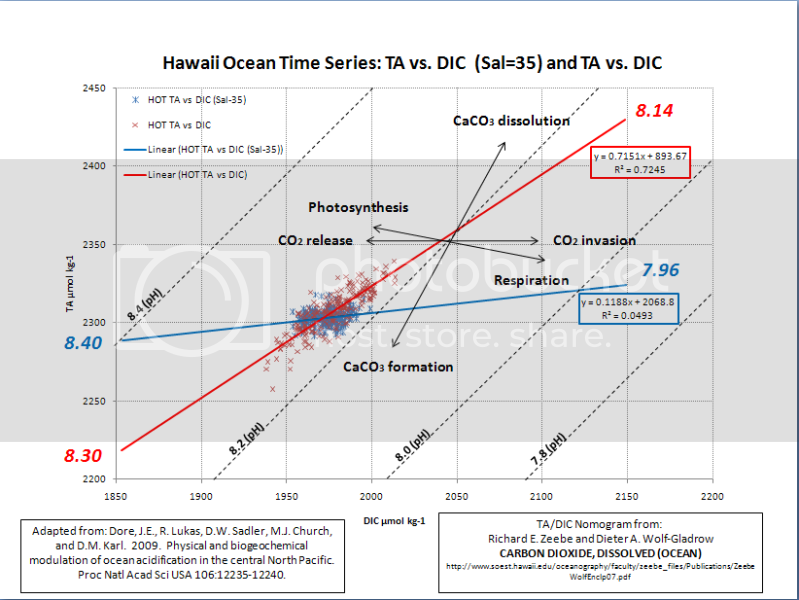 Figure 3) Hawaii Ocean Time-series, TA/DIC and pH. Why did the seawater become more alkaline from 2000-2005? The most likely answer is that the seawater concentration of [CO3–] (carbonate) increased while the concentration of [CO2] decreased during that time interval. This happened despite the fact that atmospheric CO2 levels continued their inexorable rise over that same time period. 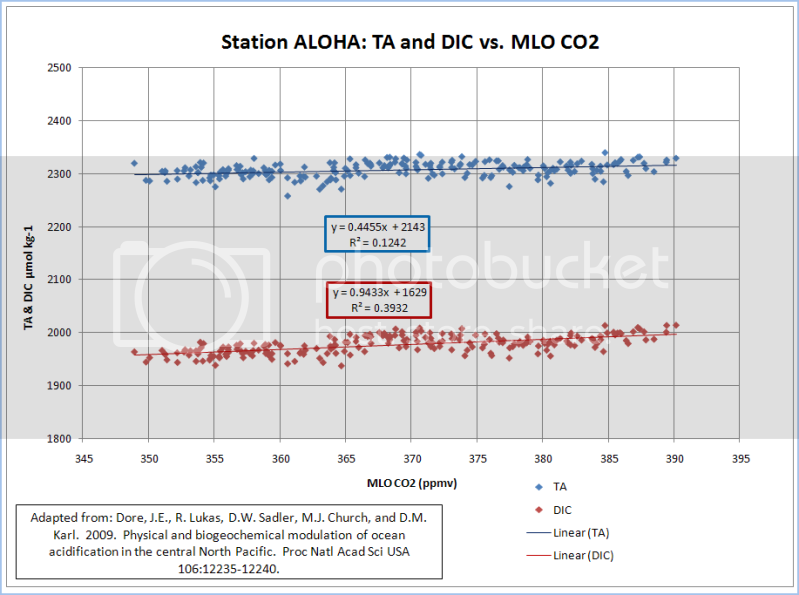 The ocean at Station ALOHA was actually a net source of atmospheric CO2 for about 5 years. 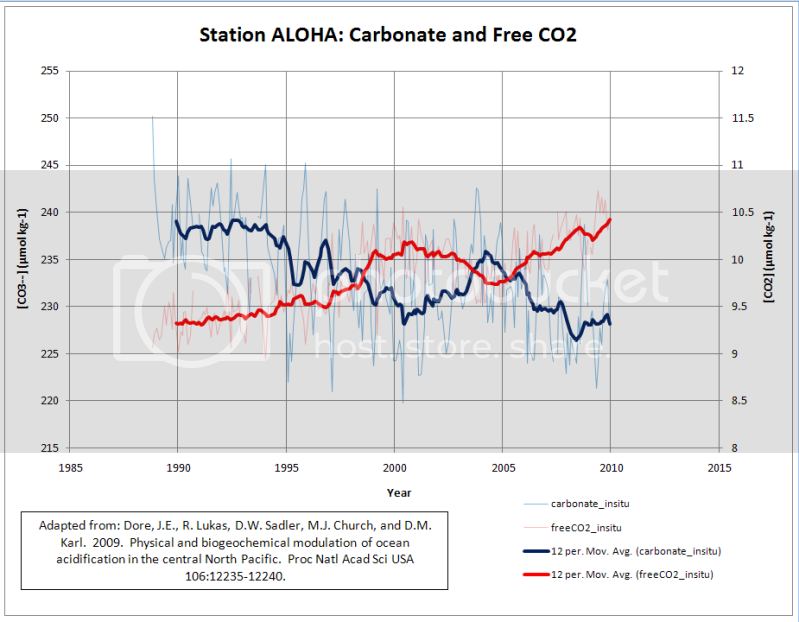 Figure 4) Station ALOHA: Carbonate increased while free CO2 decreased from 2000-2005. The reason for the carbonate concentration increase and [CO2] decrease from 2000-2005 is probably related to the slight rise in water temperature over that period and the elevated salinity. The change in water temperature and salinity was also the most likely reason that the 5-year trend of increasing alkalinity was not reflected in the calculated pH trend. 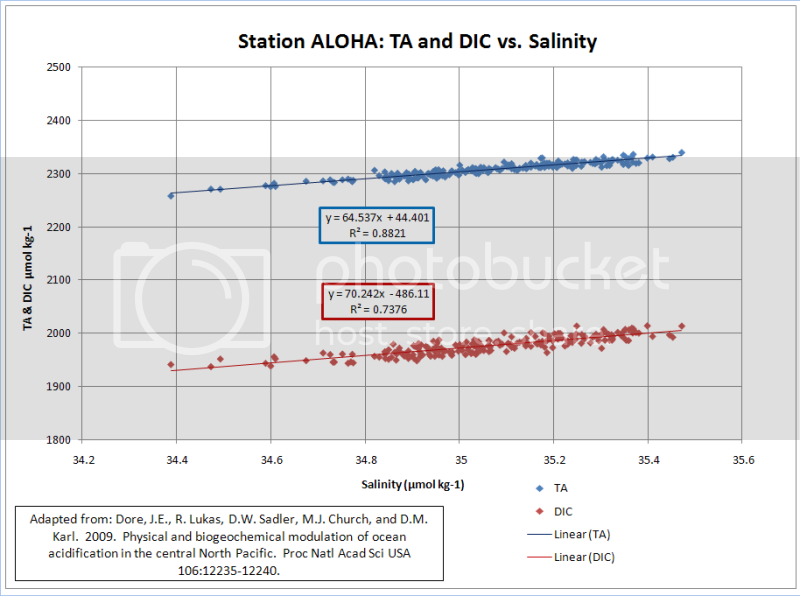 Figure 5) Station ALOHA: Salinity and water temperature. So, the data do support the notion that rising atmospheric CO2 levels can contribute to a lowering of oceanic pH; but that other processes can periodically raise the pH despite the rise in atmospheric CO2. How Dangerous is Chicken Little of the Sea? According to Dore et al., 2009, “Over the past 250 years, the mean pH of the surface global ocean has decreased from ≈8.2 to 8.1… This acidification of the sea is driven by the rapidly increasing atmospheric CO2 concentration, which results from fossil fuel combustion, deforestation, and other human activities. Models predict that surface ocean pH may decline by an additional 0.3–0.4 during the 21st century”… A total pH decline of 0.4 to 0.5 (8.2 to 7.7 or 7.6). Figure 7) TA & DIC vs. Atmospheric CO2, extrapolated back to 275 and forward to 550 ppmv. If I plot their in situ TA vs in situ DIC and extrapolated it as above (red curve), I get a very strong correlation (R^2=0.72); but I don’t get anything close to a 0.5 to 0.6 pH decline from a doubling of pre-industrial CO2 levels. I get a total decline of 0.16 (8.30 to 8.14) due to a doubling of pre-industrial atmospheric CO2 levels. 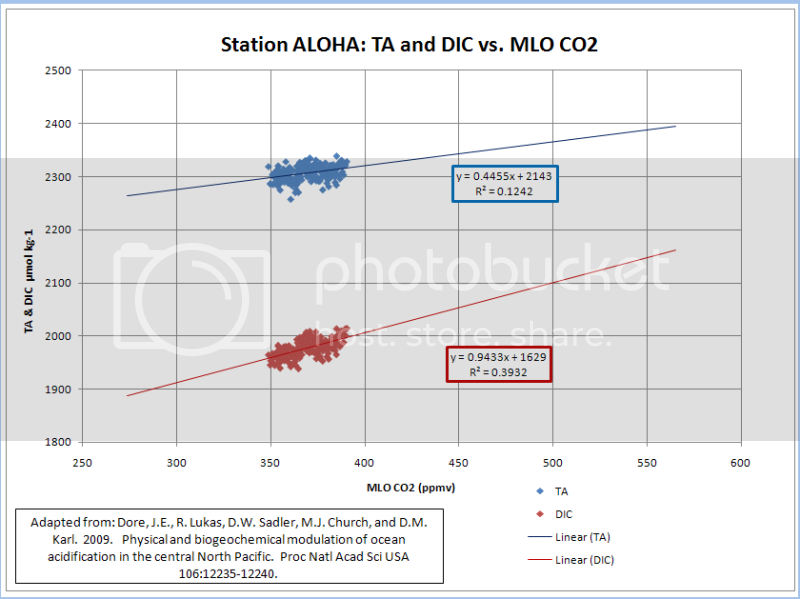 Figure 8 ) Hawaii Ocean Time-series, Station ALOHA: TA vs DIC. Red curve = in situ. Blue curve = Calibrated to salinity of 35. The normalization of TA and DIC to a constant salinity subdues the buffering provided by salinity; while amplifying the acidification effect of increasing CO2. A realistic treatment of salinity, yields an insignificant lowering of pH from a doubling of pre-industrial CO2. Chicken Little of the Sea does not appear to be very dangerous. Will Chicken Little of the Sea Wreak Havoc on Marine Calcifers? The Hawaii Ocean Time-series included ~20 years worth aragonite saturation data for Station ALOHA; so we can estimate the effects of atmospheric CO2 changes on aragonite saturation. Ries et al., 2009 experimentally demonstrated the effects of aragonite saturation changes on marine calficers under several CO2 scenarios. So, we can combine Ries’ experimental results with the observational data from Station ALOHA. I plotted Ries’ CO2 vs. aragonite saturation assumptions and found that a power function trend-line was the best fit. 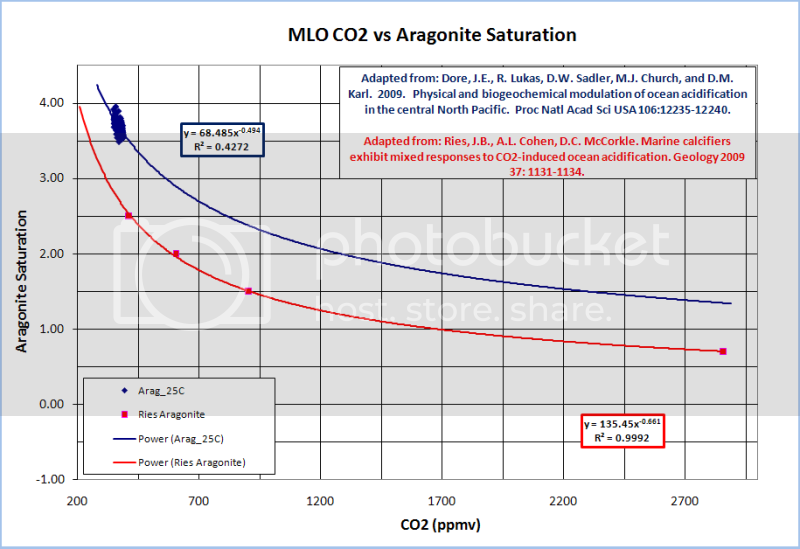 I then plotted the Station ALOHA aragonite saturation vs. MLO CO2 and applied a power function trend-line to extrapolate the aragonite saturation out to about 2900ppmv CO2. The observational data show that rising atmospheric CO2 is less detrimental to aragonite saturation levels than was assumed in the Ries experiment. The observed relationship between atmospheric CO2 and aragonite saturation from Station ALOHA indicates that even the most vulnerable marine calcifer in the Ries study (soft clam) was not adversely affected by CO2 levels below 800ppmv. Physical and biogeochemical modulation of ocean acidification in the central North Pacific. Ries, J.B., A.L. Cohen, D.C. McCorkle. Marine calcifers exhibit mixed responses to CO2-induced ocean acidification. Geology 2009 37: 1131-1134. ← BBC's Kirby admission to Phil Jones on "impartiality"
I wonder how many of the acidification Chicken Littles actually understand the chemistry. Precious few, I’ll bet. How far can you use a linear regression with pH, given that it’s a log function? A single location. A single depth. Measuring pH (w/ some procedural risk) in Nature’s most buffered solution…. Hmmm. Its perfectly legitimate to regress to pH, since the biological effects are also logarithimic as far as pH is concerned. Most biological systems use a logarithmic response: your ear, your eyes, your nose. It is the most efficient way to cope with a wide range of data: it makes sense! Literally! It is nice to do the debunking early. Bookmark this folks we may need it in the near future! Totally OT, but zeebe as in “Richard E. Zeebe and Dieter A. Wolf-Gladrow” means wolf. The very fact that the Pollo Pequeños use “acidification” as a term for the decrease of alkalinity is telling in itself. Use of the term implies that the ocean has become acidic, lending alarm to the equation, when, in reality, the water is still firmly alkaline: in other words, nothing to worry about. I experiment a couple of decades ago with CO2 injection in brackish water aquariums ( I also experimented with decomposing vegetation, something I would not recommend for armatures). I have not been able to find my data since my storage unit was broken into. But, I do not remember any appreciable change in PH non-correlated with temperature and time of day. OTOH, I do remember a significant difference between my morning and evening measurements. I see someone has already gotten onto the “pH is more than 7, so a decrease in pH is not acidification” thing. Can we all agree that lowering pH is acidification and raising it is alkalinization. There are enough issues with this area of science without descending into pedantry. It is very difficult to search for a definition of “acidification” because there is so much out there on ocean acidification. Alkalinization on the other hand is not popular, so definitions are easy to find. Most of them are along the lines of “The process of BECOMING alkaline”. Hence by those definintions, only a base can be acidified and only an acid can be alkalized. I’m fairly certain that I didn’t regress pH. I wonder whether the sulfate concentration is changing at all. If burning S-rich coal is producing H2SO4, perhaps that might have some effect in some locations on the surface. I don’t buy the CO2 connection. There is a lot of C exchange with the atmosphere, and deposition as sediment. It seems although CO2 may be involved in a fluctuating equilibrium, other drivers would be more important than atmospheric CO2. Also, there is no discussion about N fixation and the resulting increase in alkalinity. What are the ratios of C, N, and P? I’d worry more about N and P imbalance than CO2. I would expect toxic effects are more likely to occur with excess P. Of course, that sort of imbalance is more likely close to estuaries near urban areas. Algal blooms and low DO can be very unpleasant if you have to live in the sea (that is, if you are a fish, etc.). Typo? “hydrogen ([H-])” Should it not be hydrogen ([H+])? What is with this daja vu? Are the oceanographers making the same mistakes as the atmospheric people did 30 years ago? Fig. 1. Patterns of ocean pH through time at Tatoosh Island (N = 24,519). 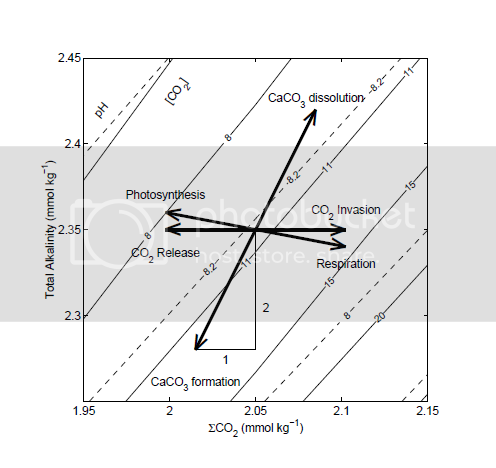 (A) Daily cycle of pH arising from photosynthetic uptake of CO2 by algal primary producers. Colors indicate month that the data were collected (blue, April; black, May; red, June; green, July; purple, August; yellow, September). (B) pH readings as a function of date and time taken between 2000 and 2007. The decline is significant (P < 0.05). The authors place most of their emphasis on the down trend, but what I always found most interesting is the extreme range of pH values they measured over a fairly brief time period and a very small area. Given that rather large variability, it seems to me that if life in the oceans was as sensitive to minor changes in pH as the catastrophists claimed most of it would have disappeared long long ago. On a side note, at about the time this paper came out, I was chasing links on this topic one day and I came across a couple papers that suggested a multidecadal oscillation in the mean pH of the oceans over a 0.4-0.5 range and a 30yr or 60 yr timescale as I recall. Unfortunately I got distracted and didn't bookmark them and I haven't been able to find them again. Has anybody else seen these papers? If so, I'd appreciate a link. What a good post! Thank you. Seems the ocean is more resilient than the team. According to my text books on oceanography the pH varies between 7.9 to 8.4 in ocean surface waters. So this small change is within the natural variation!?! What is the problem. Any pH change round Hawaii is more probably due to volcanic gasses which at the black smokers on the oceanic ridge system, divergent boundaries, the pH has been measured at 4.5. In spite of this acid molluscs seem to thrive and have done for millions of years. The paper you are trying to recall is Pelejerso’s pH reconstruction of Flinder’s Reef. The [I]Science[/i] paper is available with a free AAAS membership. 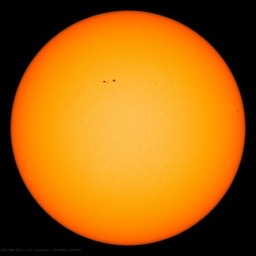 The data are available from NOAA’s paleoclimatology library. Pejejero demonstrated a ~0.5 pH oscillation with a ~50-yr period, highly correlated to the PDO. 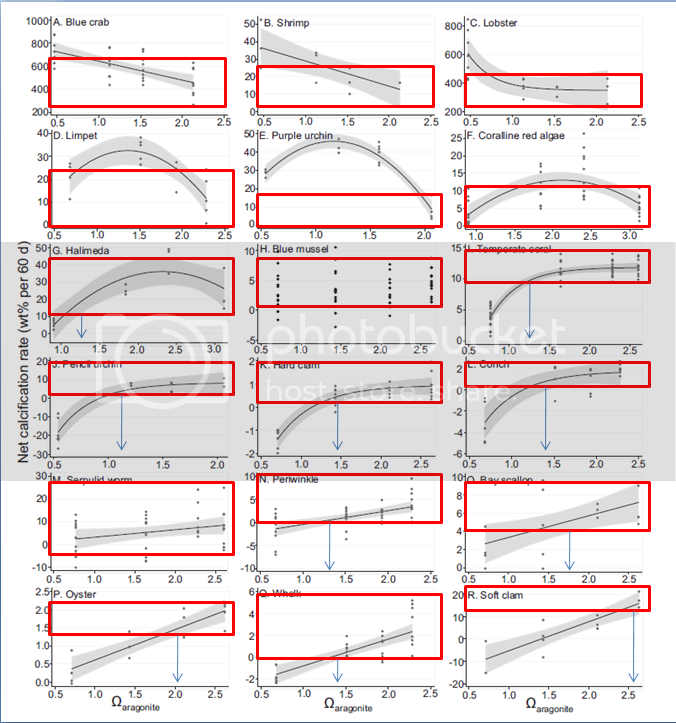 Coastal and coral reef waters exhibit wide variations in pH on times scales ranging from diurnal to multidecadal. Open ocean waters generally exhibit less variability. In the opening graph from Dore at al 2009, why is pH at 30 m depth about 8.08, and then (after a data gap), pH 8.07 at 235 m depth? Given that one cannot place any confidence in a pH change of 0.01, why is there an “inconvenient” data gap from 30m to 135 m depth? At what depth at this location is the unconformity between near-surface waters with pH around 8 and deeper waters around 7.6 or so? I realize that there is said to be little mixing of waters either side of this horizon, based on salinity, conductivity etc measurements, but surely it would take only a little mixing to wipe man-made atmospheric CO2 largely out of contention, partly because of the logarithmic mathematics for pH in mixing. Like, equal volumes of pH 7 and pH 8 do not mix to make pH 7.5.
pH is the negative logarithm of the hydrogen ion activity. Twenty years of actual data from Station Aloha demonstrate that the models (like the one posted by Dr. Barrett) are not reflective of the real world (see Fig. 8 in this post). I remember reading a paper on the chemistry of meltwater from an alpine glacier and there was a significant diurnal trend.Bearing in mind the complexity of the chemistry of the sea close to shore( within continental shelf), there is going to need a vast amount of data with regard to spatial , temporal and determinants to ensure valid conclusions are arrived at. Lagoons and bays in tropical latitudes have extremely variable chemistry. Inputs from sewage, soil run off , algal blooms churning of sea bed by dredging, etc , etc are all going to make near shore chemistry very difficult to analyse. While I understand the point you are making, I can’t help but feel that if you were stood outside at the south pole about now and noticed that the temperature had risen from -40°C to -35°C , you wouldn’t be saying that it was getting hotter. further to davidburton’s comment, I did a ‘back of the envelope’ calculation on the assumptions that half of human emissions are partitioned into the hydrospehre and marine biosphere, and that the ocean is generally reasonably well mixed (i.e. an assumption that may not be applicable for barred basins, lagoon areas and lakes but probably applies for the vast majority of the ocean). The mass of the oceans mean that the change in dissolves CO2 would be less than 1 ppm, and so the consequence on pH by the ‘increase’ in carbonic acid would be undetectable. There are possible causes of acidification of near shore waters because of run-off from fertilisers and other local pollution sources, and these should be dealt with as far as reasonably possible, but I honestly don’t see CO2 as a significant problem in this regard. Anyone ever see any study on the relative impacts on near shore waters from changes in terrestrial organic acid loads (result of afforestation etc), changes in soil water logging due to agricultural draining and 20th century fire suppression? David, station ALOHA is one of the main stations for monitoring upwellings………. Are we dealing with a model here? If so, throughout the word “concentration” or “concentrations” are used. Should we not be talking about “activity” or “activities”. There are significant differences in a system as complex as seawater. For the last 25 years, Volcanoes Pu’u O’o cone, and Kilauea . has been spewing it’s contents all over the Aloha State. Need a wider sampling area. You sound like an intelligent person and educated in science. There are many such scientists posting on WUWT, and I do not doubt that we could all agree with you, for rational intelligent discussion, especially as it is a well used colloquialism in chemistry. The problem though is when cretins like Grossman and her ilk (see other thread) get a hold of the term “acidification” and pollute its meaning, using terms like “alarmingly corrosive”. That’s why it’s always corrected on here – so that people with no education in science who read these threads can see the difference between what the scientists say and what the cretins say. I had read that paper also, a while back. My main interest at the time was environmental variability in estuary habitats. Most of my brackish aquarium experiments were focused on that. Before I had read this paper, I had assumed that Marine PH was fairly constant, unlike estuary PH ( which is all over the map). I now have a whole set of new experiments I would love to run, once I get the space and time to do them (anything less then 200 L tank size is a waste of time.) I think I can demonstrate that dissolved CO2 is dependent almost entirely on the rate of kariote metabolism, and not atmospheric CO2 concentrations. BTW, for anyone interested in brackish water Aquariums, I recommend at least 1 watt/liter for lighting, turning the water over at least 6 time/hour, NO BUBBLES, and varying salinity between 10 and 30 ppt on a yearly cycle. I tended to do my weekly water changes (10%) with water that was a few degrees (C) cooler then the tank water ( 25 – 28 C). Geoff Sherrington says: November 25, 2011 at 2:46 am Addendum. Sometimes I pick on a graph or paragraph that is not easy to understand – then give it a comment that is misleading in the sense that it could be read a certain way unless you were skilled in the art. Sometimes i do it to see who is reading what how carefully. Therefore, without prompting, I wish to state that my comment above on the Dore at al graph of 2009 is wrong. On first view it looks as if the reader is invited to do what I did, to wrongly assume that the various pH graphs run on from each other from right margin back to left. Of course, they do not. My apologies to Dr Dore for using his graph as an illustration of the value of clarity in presentation, of which most of us are guilty of forgetting at times. However, the possibility of leakage over the halocline or whatever you name the discontinuity between shallow waters in the pH 8+ range and deeper ones in the 7.5- range, remains a concern. The position of station Aloha might make it a candidate for mixing from upwelling, but that is conjecture.